I am just starting to learn Morse code and got a brand new key from American Morse Equipment. Most keys need to be mounted to hold them in place while the operator is dah-dit-ing. Keys are mounted on a heavy platform, or fastened to a radio. And some keys are worn on a leg strap. 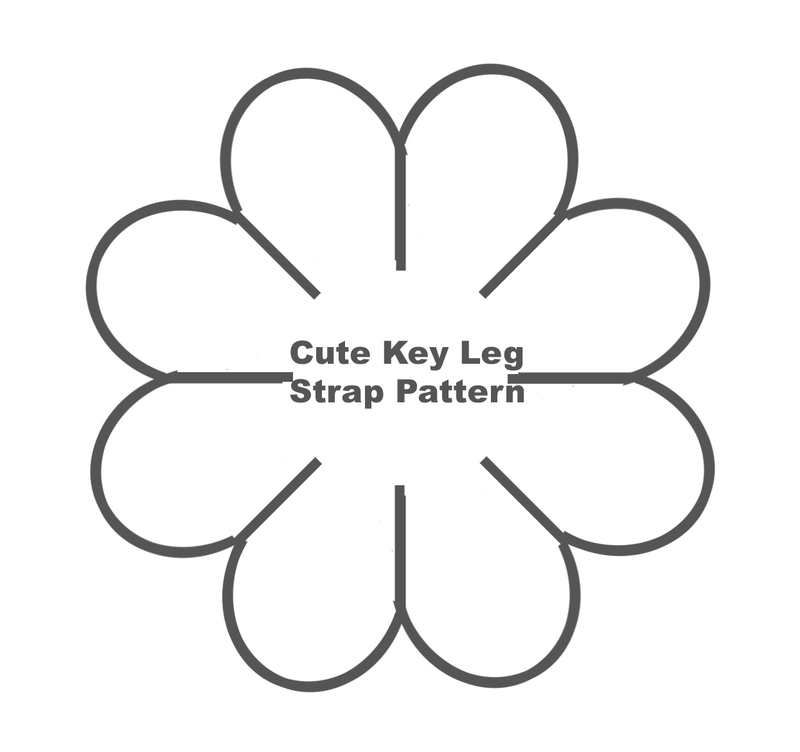 As a lady operator, and fashion designer, I wanted something cuter to keep my key on my leg, so here it is — how to turn a standard leg strap into a cute Morse code key leg strap. 1. Using the measuring tape, measure around your leg where you’d like to wear the strap. Subtract Â½” from this measurement and cut the lace and patterned ribbon to this length. 2. Using a sewing machine, straight stitch the edge of the ribbon 1 1/8″ in from the edge of the lace. 3. Fold the lace along the stitched edge of the patterned ribbon. Fold the satin ribbon in half and sandwich it inside of the folded lace so that they overlap by Â¾”. 4. Using the sewing machine, zigzag stitch the edge of the lace to the ribbon. Start by forward stitching across the width of the ribbon. When you get to the edge, back stitch across the entire width. Then forward stitch across the entire width. You will have stitched over the same place three times to securely hold the ribbon in place. 5. Repeat step 4 Â½” away from the first row of zigzag stitches so that you will have two rows of stitches. 6. Cut away excess ribbon and lace so that the strap will be nice and neat. 7. Using the sewing machine, straight stitch the unsewn edge of the patterned ribbon. 8. Using the flower pattern, cut along the gray line. Cut 4 flowers from the tulle and 2 flowers from the organza. 9. Layer the flower pieces: two tulle on the bottom, one organza, two tulle, and one organza on the top. 10. Most leg straps have a separate plate or piece which the strap feeds through that connects to the key, often by a screw. The fabric flower will go between this plate/piece and the key. Place the fabric flower on the plate/piece and make a hole in the flower for the screw to fit through. Then screw the key in place on top of the flower and plate/piece. 11. Thread the ribbon into the plate/piece, and strap your key on your leg tying the ribbon at the side.